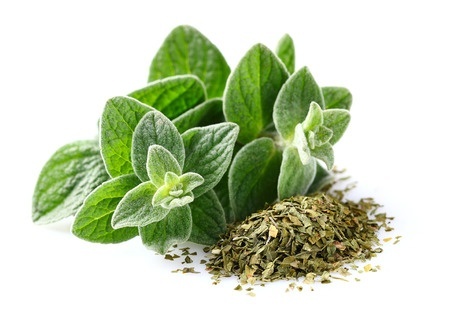 The word oregano is derived from Spanish orégano, from Latin orīganum, from Greek ὀρίγανον (orī́ganon). This is a compound of όρος (óros), "mountain", and γάνος (gános), "brightness", whence "brightness of the mountain". Oregano's most prominent modern use is as the staple herb of Italian cuisine. Its popularity in the U.S. began when soldiers returning from World War II brought back with them a taste for the "pizza herb", which had probably been eaten in southern Italy for centuries. There, it is most frequently used with roasted, fried, or grilled vegetables, meat, and fish. Oregano combines well with spicy foods popular in southern Italy. It is less commonly used in the north of the country, as marjoram generally is preferred.